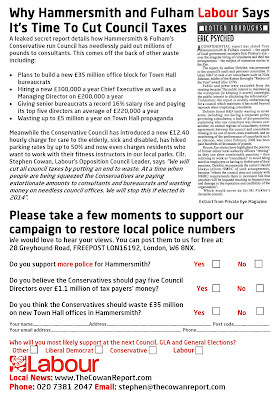 Over the last year my fellow Labour councillors and I have resumed our campaign for cuts in council taxes. Times are tough but the council has the money to do it. Today the Council announced that it will cut roughly £30 from the average band ‘D’ council tax bill. That’s a move in the right direction and I'm sure it will win them some easy headlines. But H&F Conservatives are like an octopus that gives with one arm but rifles through your pockets and takes your money with its seven others. Early on their Administration introduced nearly 600 new or higher inflation busting stealth taxes. The Telegraph have put them on their List of Parking Shame for, until this year, introducing nearly 60% hikes in charges in a single year; elderly and disabled people now pay £12.40 an hour if they need home care; and even introduced new charges this year for people who want to use a personal trainer in our parks. 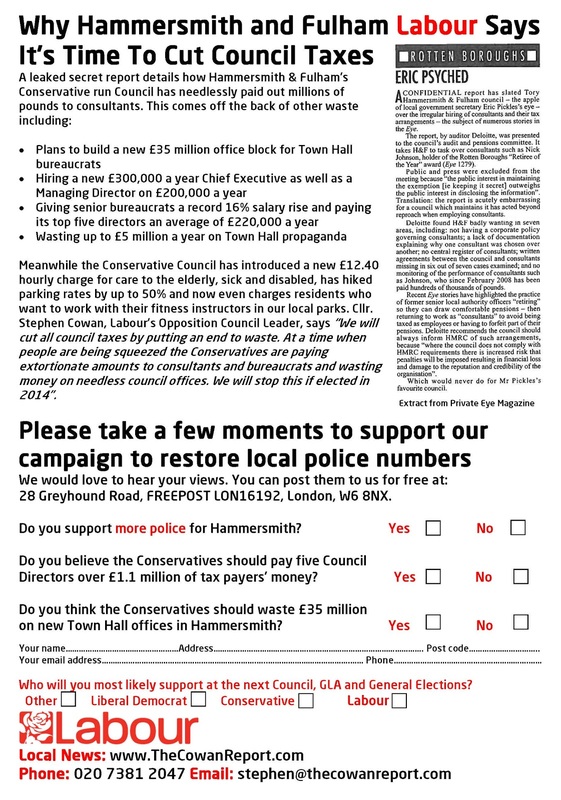 The real mission for H&F Conservatives should be how can they genuinely put more money back into the pockets of hard pressed households up and down the Borough. Wasted up to £12million on employing unnecessary consultants that the council admitted were paid despite many no longer doing any necessary work for the council. H&F Council have now paid this consultant almost the same as a 2% council tax cut for every Borough household. And the culture around respecting public money is wrong when they argue it’s OK to spent £7,000 on a booze up that started on a Monday afternoon. There is more and it can be stopped. Labour will cut Council Taxes should we win the election in 2014. We will use zero based budgeting to access all H&F Council’s expenditure and will strip out waste such as that listed above.